AMOB Electric CNC tube bender Ce CNC R series are the ultimate in efficiency and green technology. This innovative range of bending machines was born out of a growing concern with rising energy prices and production costs, and also a need to reduce energy consumption intelligently. Processing tube from 35mm up to 90mm OD, these tube benders are especially relevant for medium to large jobs. Available in single stack, double stack or multi-stack capabilities as well as fixed and variable radiuses in the same cycle, they also allow bends with no straight between them when equipped with more than one stack feature. There is also the option of adding welding detection, punching/cutting mechanisms and integrated loading or unloading systems. 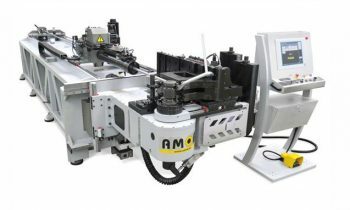 Finally, we equipp all Ce CNC R series electric bending machines with the latest AMOB 3D bending software. So, if you’re looking for something in between the CH and eMOB series, these hybrids are a great compromise. Servo controlled POB: All Ce CNC R planes of bend positioners are servo controlled (up to 4 axis). Multi-stack capability: Ce CNC R models are available in single or multi-stack, fixed and variable radius capability. Low and easy maintenance: All Ce CNC R models are built for low and easy maintenance. Fixed and variable radius: All Ce CNC R models have multi-stack, fix and variable radius capability. Online diagnosis: AMOB CNC models permit online safe access for online diagnosis.